Every now and then a really engaging and fun project comes along. This time the project wasn’t in my studio or in the studio with some of my excellent students. 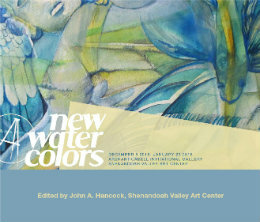 Rather, it was curating the New Watercolors exhibition at the SVAC (Shenandoah Valley Art Center); it was a really wonderful challenge. As the works came in from up and down the mostly east coast states, I was really pleased with the quality and variety that I saw before me. When all the work had arrived, I found myself in a bit of a quandary; I could frankly see two or three versions of the show based on the work I had. In the end though, I chose to simply pick the best pieces from each of the major themes and ways of working that the artists had placed at our disposal. The seventeen artists included in the show were: Randy Akers, Ananda Balingit-LeFils, Carol Barber, Jane Forth, Rachel Gaudry, Carl Gombert, M. Colleen Harrigan, Scott Hillman, Annie Parham, Chee Kludt Ricketts, Susan Crave Rosen, Beth Shadur, Jane Skafte, Amy Smith, Chhiv Taing, Steven Wolf, and Junko Yamamoto. Each works in an exciting, new, and/or experimental ways with aqueous media. Upon close inspection, you way notice that he has layered his aqueous media over a toned ground; something not seen very often … and often frowned on by many modern watercolor “traditionalist.” In fact though this is a practice that goes well back into the history of water media painting. 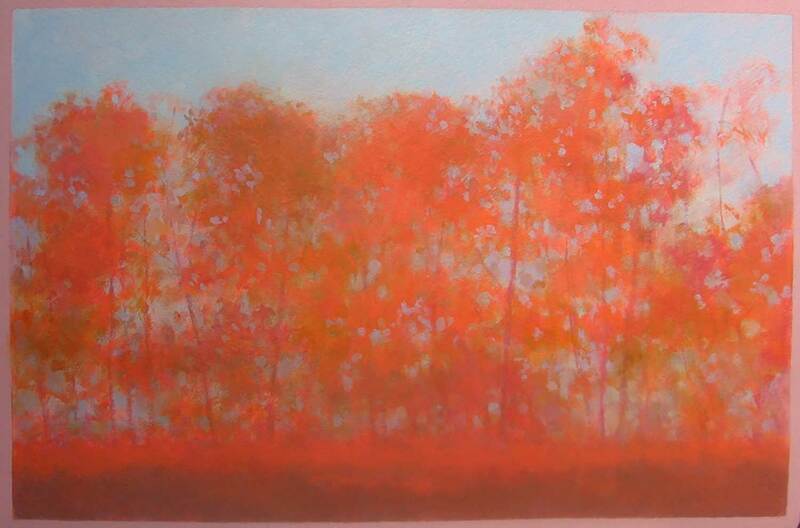 It gives Steve’s color passages a subtle, and I think, evocative quality. A number of artists in this exhibit sent in pieces that made use of collage in some manner. This past century has seen artists of all kinds and techniques embrace the concept of collage; from the Surrealists and Cubists of the early 1900s to todays mash-ups and sampling in the performing arts. Collage has become a basic tool for artists. 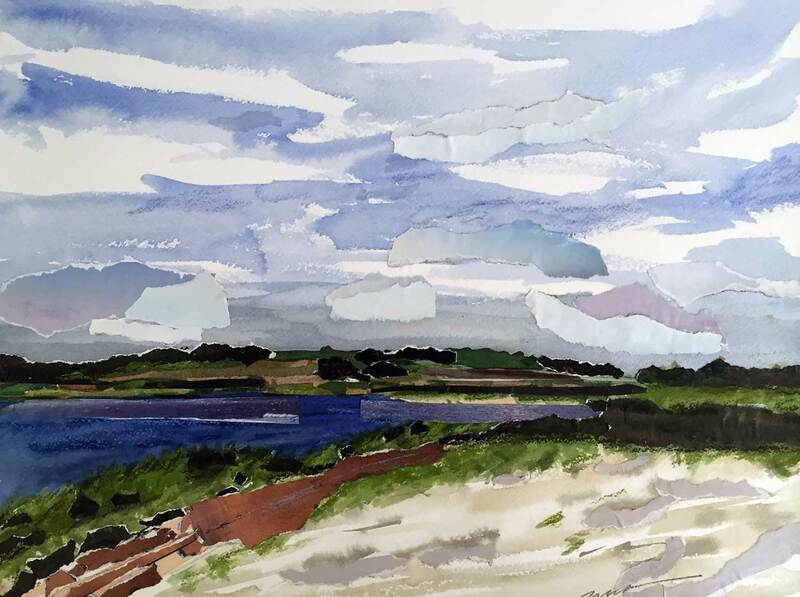 Colleen Harrigan’s Cape Pogue is a classic collage with its torn and layered paper merging seamlessly with rough and irregular brush marks to create a Martha’s Vineyard seaside. This work is an interesting take on the watercolor seascape; it is a somewhat more quiet and calm version than one would seen from John Marin’s collage like arrangements of color in his watercolors of the coast. While I suspect Marin’s work has informed Ms. Harrigan, it is just as likely that the late seascapes of Homer or Sargent may have been in her visual memory as she navigated this supple composition. A totally different approach to collage and water media is evident in Jane Skate’s Four Sisters. The multi-panel piece appears to be a joyously abstract tour de force of swooping, flying shards of color contrast with solid and stable shapes and richly layered hues holding the piece together behind all the action. I have seen her work before and know that her abstractions often stem from careful observation of spaces and objects. Here, anyny references here alludes my eye … and I get lost in the contrast of ragged vs clear edges, the complexity of the color harmonics, and the dynamic movement of shapes. There is one artist in the show who has taken the idea of collage deeply into his working methodology. You may not recognize it at first though. 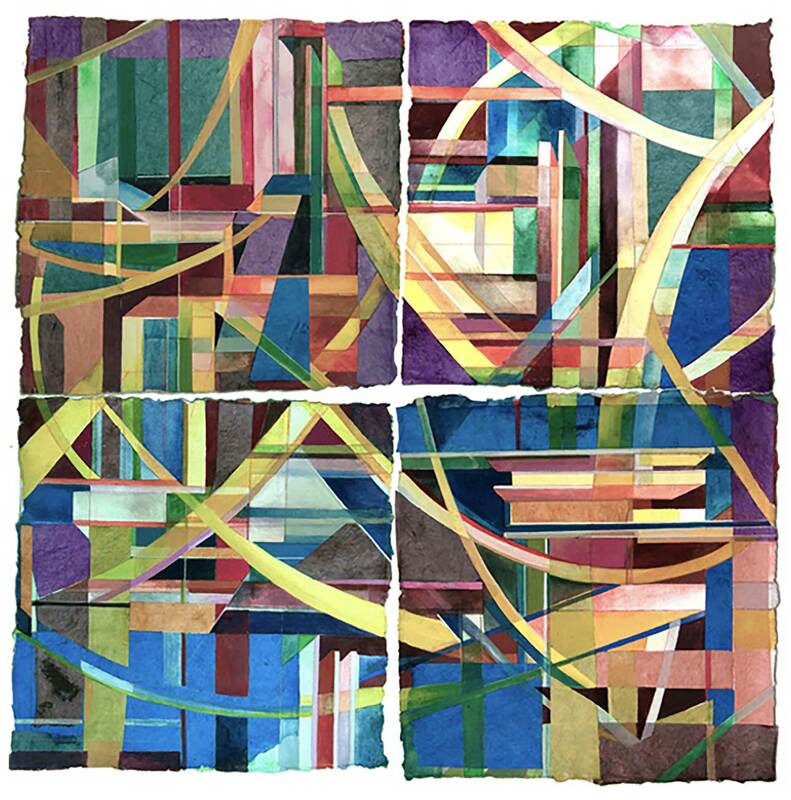 Carl Gombert layers objects and images on a surface with the abandon of a collagist, but his liquid layers of color may be hand applied or may be stamped onto the surface. And right beside these layers of color you may find rhinestones, glitter, and broken pieces of mirror. Mr. Gombert’s subject matter, well lets just say it is as much influenced by street art, circus advertising, and tattooing as it is anything one might find in a curiosity shop or a 1950’s variety store. His four foot tall Explanation does not fit the standard idea of a genteel little watercolor. That is part of why it is such a wonderful addition to this show! A very different way of working is evident in a few pieces included in this exhibit. Many artists have begun to paint more frequently on non-paper surfaces in recent years. 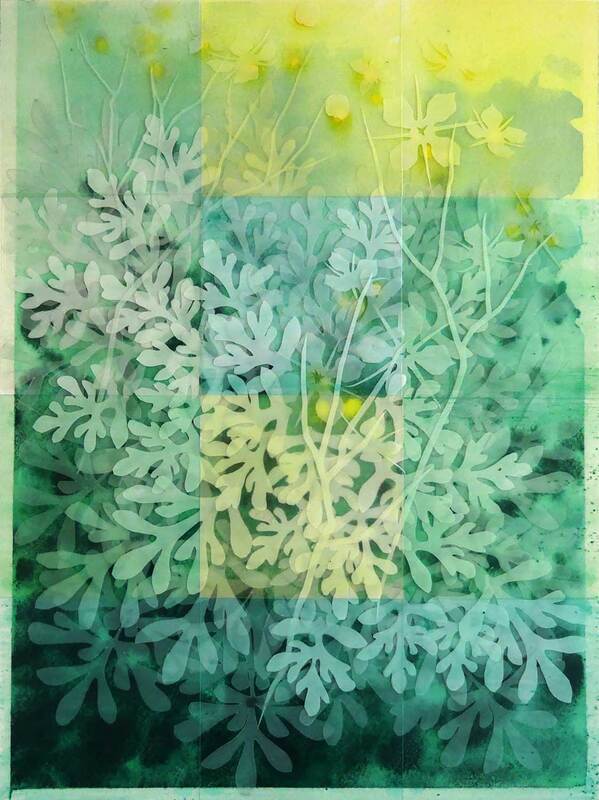 After centuries of using traditional white papers in the western and asian traditions, artist have begun to explore woods and plastics, even glass as a painting surface for watercolor and other aqueous paints. One of the artists in this show, Amy Smith, is working on the new plastic sheeting known as Yupo. It is a synthetic fibers material that acts much like paper but has a surface that will not absorb the liquid paint. Due to this, the color sits up on the surface, remains much more vidid in hue and intensity, stays wet longer, and can thus be manipulated much more freely. This can scare some artists. Not Ms. Smith, whose Solid As A Rock is a rather raucous jumble of rich color. She has taken watercolor’s liquidity and given us as much “chunkiness” as it is probably able to manifest. 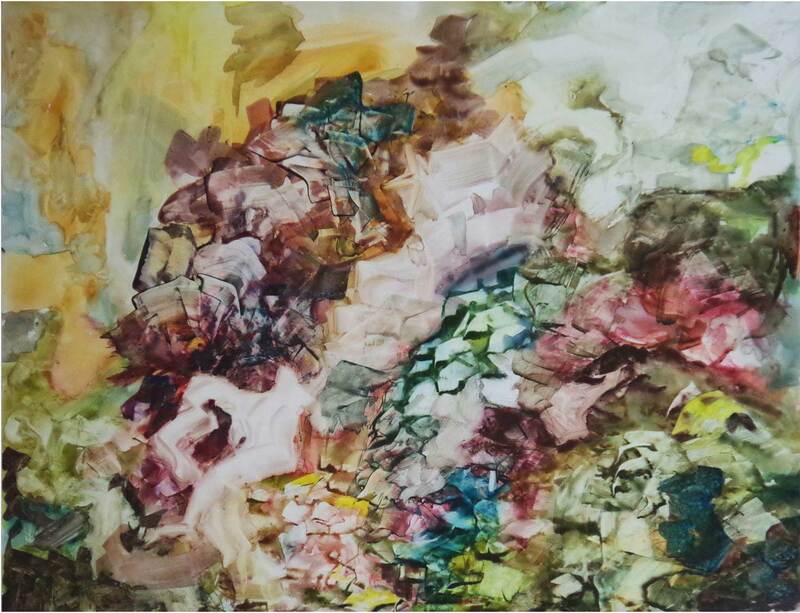 and surface is presented by Chhiv Taing, in Rue Graveolens, which was created by layering aqueous color on paper and translucent film and combined with colored film as well. These are not just layered, but cut into sensuous shapes. The layered density creates a sense of weight and heft while the translucency of all the materials clearly communicates an airy quality. That contact, and the delicacy of the shapes and hues makes for a joyously realized image. Perhaps the most intriguing work for me was in some ways the simplest of the works that came into the exhibition. It was sent to us by Junko Yamamata. 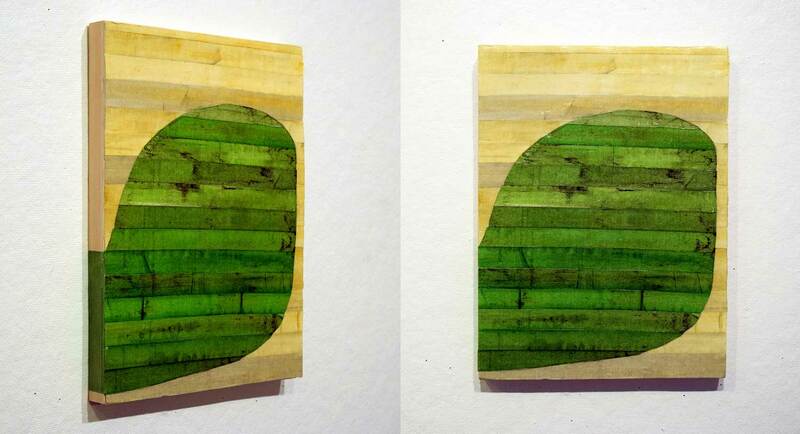 The work, titled 05, was created using paint and ink on strips of an oriental style paper mounted on wood. Despite the relatively small size of the work, Yamagata has created a forceful and dynamic presence through the sheer intensity of color and the utter intentional clarity of shape. As I said, this has been a wonderful experience for me; visual surprises almost always are! The exhibition, at the Shenandoah Valley Art Center, located in Waynesboro, Virginia, opened on Saturday, December 5th, 2015 and ran through January 23rd, 2016. If you would like see more of the works from the exhibition, there are several ways to do so. The large and small printed catalogs are still available at Blurb.com. There also two ways to get to see all the images for FREE as well; you e-mail me and I can send you a pdf of the catalog … or for those who would like an e-book version, you can also download the free one from Blurb.com site.